Found today at our friendly neighborhood multinational retailer, the large Rubbermaid drain board in red. Call it the midlife-crisis drain board. Call it Big Red. For years Elaine and I have been on the lookout for Big Red. Small red drain board? Yes. Large red? No. Never no large. But there it was today, and here it is now, in our crisis-free kitchen. “I’m catering to people who are willing to pay $125 for a machine that was obsolete fifty years ago”: Bob Montgomery, who will be ninety-three in January, is a typewriter repairman. 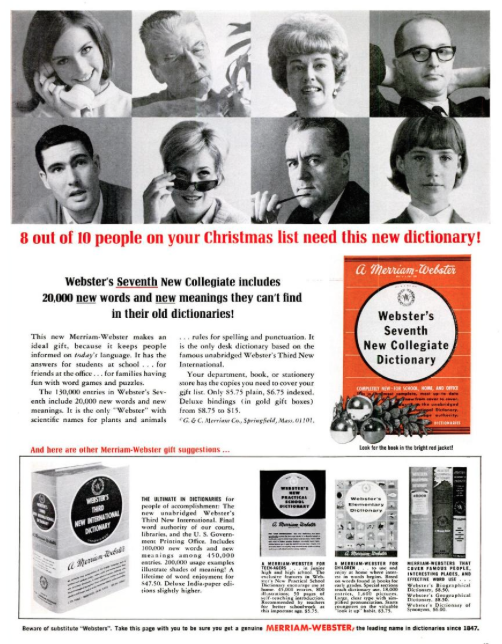 Given the all-white world of Merriam-Webster’s 1965 and 1966 Life advertisements, I wondered: did the company ever advertise its products to African-Americans? I checked the Google Books holdings for Ebony and Jet and found a single ad, which appeared in Ebony in October 1967. It’s clearly pitched to parents wanting to do right by their children. No reference to “friends at the office” or “families having fun with word games and puzzles”: here the dictionary is a means to academic success. Which it is. Consider The Dictionary Project. And now I remember what we had in the house when I was a kid: the World Book Dictionary, and of course, the World Book Encyclopedia. Great bathroom reading. But that table, that chair: now I’m back in my high school’s library. It’s study hour again. 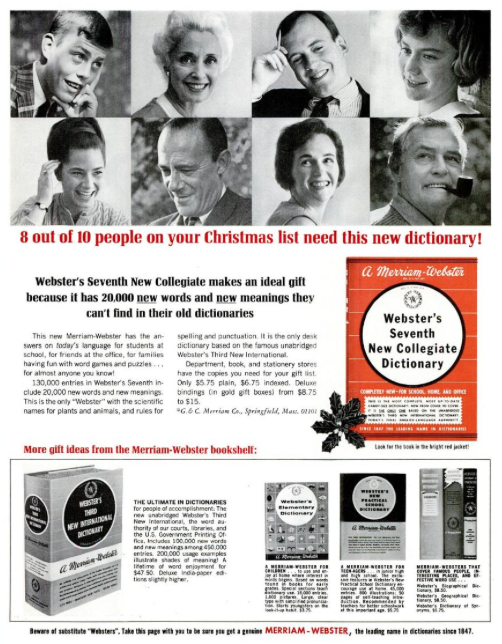 Sixteen of twenty people on your Christmas (or “holiday”) list need a Merriam-Webster Collegiate Dictionary. I used to recommend that students acquire and use a collegiate dictionary. Now I say college-level . Can you guess why? The four people who have no need of a dictionary will be happy with Parker T-Ball Jotters. 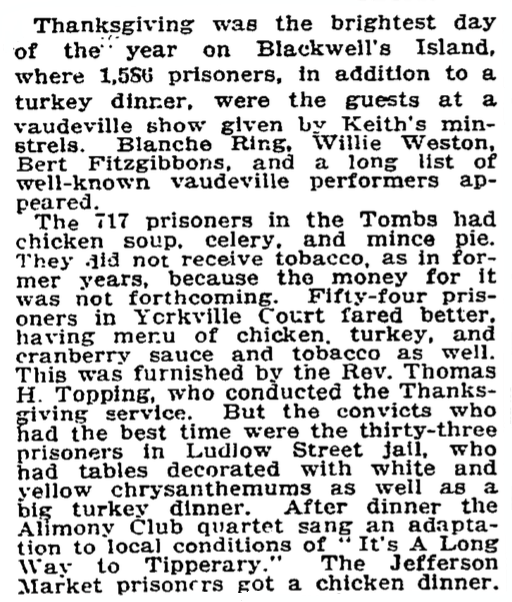 My 2012 and 2013 Thanksgiving posts also dropped in at the Ludlow Street Jail. Grammarly, WhiteSmoke WhiteSmoke now has a demo, and the results do not inspire confidence. 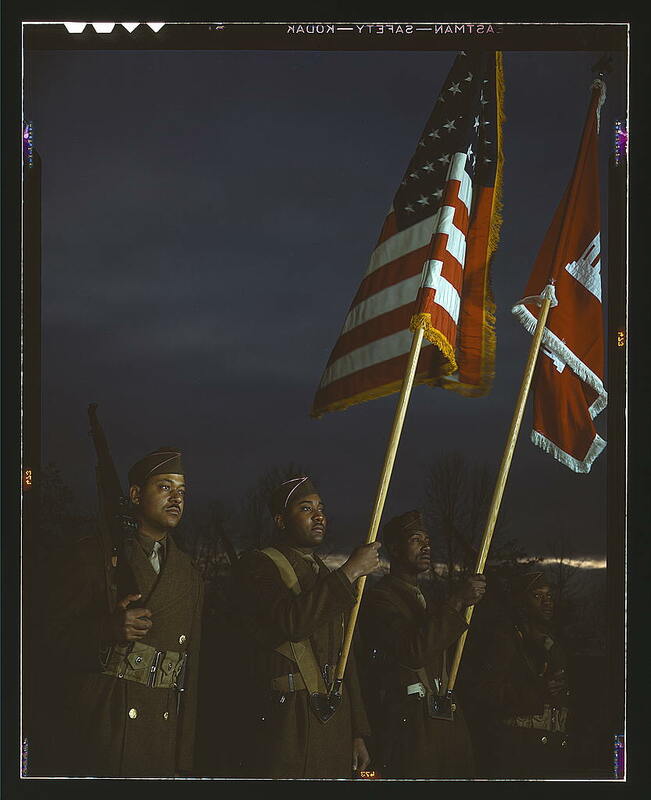 In 1943, the Grote companies combined under the name Grote Manufacturing Co. Like most other manufacturers of the time, Grote refocused its production on the war effort. It began making items for paravanes (devices that cut underwater mine cables), acrylic radio-controlled shells, and blackout lights. Once the war was over, the company converted its metal stamping machines to make medicine cabinets. 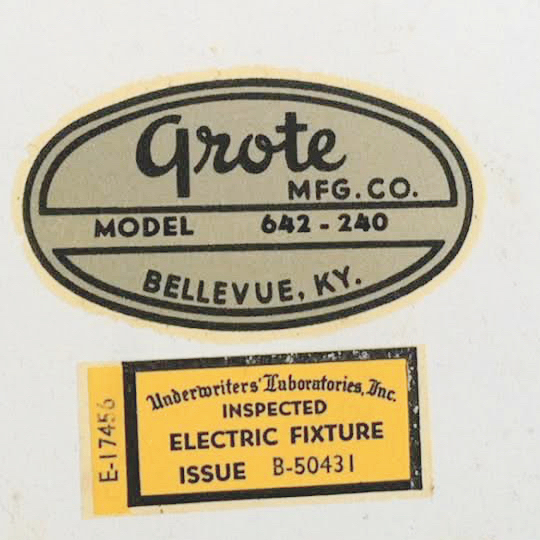 Grote Mfg. Co. sold its medicine-cabinet division in 1970. As Grote Industries, the company rolls on. Our Grote medicine cabinet is now gone, along with our other bathroom fixtures. Goodbye, old Grote. Goodbye, inside-cabinet-door labels. Bathroom-wise, we are stepping into the world of tomorrow, or at least the world of the next week or two. I had to stop myself from saving the blades of shavers past. I was browsing in the library and noticed Castiglione’s The Book of the Courtier. I still have it in paperback from undergrad days. And then, just two books away on the library shelf: Ted Allen, et al., Queer Eye for the Straight Guy. Did someone stash it for further browsing, as library patrons sometimes do when they’d rather not borrow a book? No. BJ1518-1697: Individual ethics. Character. Virtue. Including practical and applied ethics, conduct of life, vices, success, ethics for children. Castiglione’s call number: BJ1604 .C43 1967. Allen, et al. : BJ1601 .Q44 2004. For sale: a letter of transit, used only once. Also a piano, restored. And many other pieces of film history. The New York Times has an article about a Bonham’s auction. November 25: The Times article now has auction results. The letter of transit sold for $118,750; Sam’s piano, for $3,413,000. In Fall 1986 and for a semester or two thereafter, I taught first-year college composition, “freshman comp,” with word processing. I was the first person in my English Department to do so. My enthusiasm waned when I saw no evidence that word processing made for significant improvement in students’ writing. If anything, it seemed to offer a too-easily-taken shortcut to a finished essay, without the large-scale rethinking and revising that might best take place on paper, with the aid of arrows, asterisks, staples, and tape. Computers are no quick solution to the problems of our freshman comp students. A computer cannot tell a student that a thesis is too general or that an essay lacks specific details and is illogical. A computer cannot spot punctuation errors (programs that claim to do so, such as Sensible Grammar, in reality find mere typos, like a space before a comma). There are word-processing programs that can catch some spelling errors, but they cannot tell when “to” should be “too.” The claims made for computers as thinking machines are enormous, but real intelligence can lie only in the hands on the keyboard. God knows we have all read inane, jargon-ridden, stultifying prose produced with the slickest of word processing programs. My claim is more modest: a computer — used intelligently — makes life easier. Twenty-seven years later, I think that these observations still hold. Nothing can yet replace writerly scrutiny of grammar and spelling. I still see no evidence that word processing has made for better writing. And it amuses me to realize that while many an English Department still houses a “computer lab” (a classroom filled with the hum of machines), the prospect of writing in a word processor has come to feel faintly quaint. With so many minimalist apps available, the work of composition can happen in distraction-free environments far more congenial than Microsoft Word. And anyway, writing is not word processing. Margins, fonts, and pagination are matters of document design, not writing. I design documents all the time, but I cannot recall when I last wrote in a word processor. It’s sad to see a once-great brand sink into crappy cheapness. 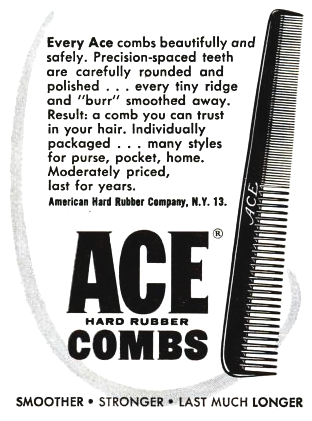 I know that Ace combs are no longer made of hard rubber. But I’d at least expect a plastic Ace to comb hair without raking and scraping the scalp. No such luck. I bought an Ace yesterday and tossed it after one use. That’s how bad it was. If, however, tiny ridges and “burrs” are your thing, today’s Ace is what you’re looking for. Ouch. I still own a hard-rubber Ace, many years old. That, friends, is a comb. 2.Anything that’s invented between when you’re fifteen and thirty-five is new and exciting and revolutionary and you can probably get a career in it. I‘m not so sure. I’m fine with the scroll wheel (1995) and the Toyota Prius (1997). I have no interest in, say, TiVo (1999), but it’s no more against the natural order of things than recording with a VCR. Google Glass (2013) though is against the natural order of things, for people of all ages. It just is. I do not yet understand the grammar of Mark Trail’s interjections. Is whooa reserved for interior monologue? For underwater use? For moments when one’s own life is in danger, and not some bear’s? For use when one is at least partly clothed? Clearly, more study is needed. Whooa! I misheard what I misheard. But then there’s this shining moment. Perhaps the tipster was a hipster after all. Mich wundert, das ich so frelich bin. Someone was describing how he used to escape from the business of the Empire now and then by retiring to a remote castle in the Tyrolese or Styrian forests. Scorning muskets and crossbows and armed only with a long spear, he would set out for days after stag and wild boar. It was during one of these holidays that he composed a four-line poem, and inscribed it with chalk, or in lampblack, on the walls of the castle cellar. It was still there, the speaker said. I am astonished I am so cheerful. These lines remind me of a sentence from Guillaume Apollinaire: “la beauté de la vie passe la douleur de mourir.” And of lines from Frank O’Hara: “Grace / to be born and live as variously as possible.” All wonderful, compact philosophies of life. The CNN film Ivory Tower (dir. Andrew Rossi, 2014) airs on CNN this Thursday, November 20, at 9:00 p.m. Eastern. Educators talk about and analyze test score data, and supposedly let that data “drive instruction,” but the truth is that numbers and measurements gleaned from those tests are not data. They are a flat, bleached replacement of data, because they replace the substance of learning with an abstraction, a false image of learning, much the way Descartes replaced the idea of physical things with the concept of graphable spatial extension. The acts of thinking, learning, and knowing, are not objects that can be replaced with abstractions about thinking, learning, and knowing. In that specific but crucial sense, all school test data are fake. I wish I had had Mr. Altman for English. 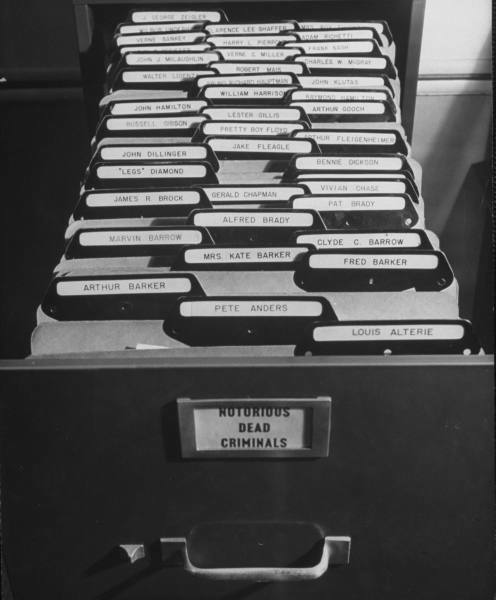 The file-drawer label “Notorious Dead Criminals” is worthy of Chief Wiggum. 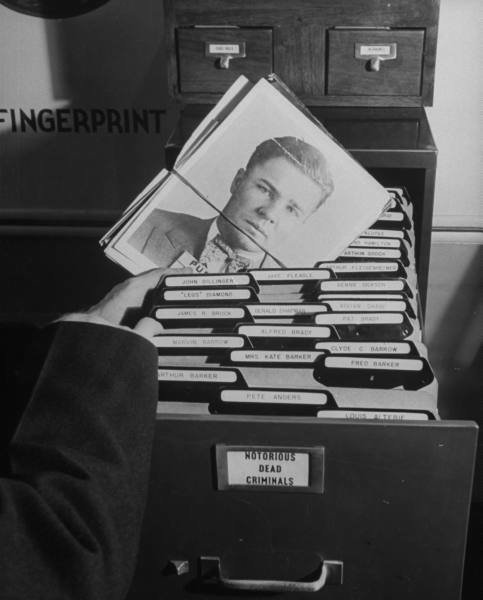 That’s Pretty Boy Floyd in the second photograph. Public radio ought not to serve as an organ of publicity for junk-pop-culture. NPR’s willingness to do so makes me less and less interested in kicking in to support NPR. In twenty-five years of writing, Ted Berrigan created a poetry that melded intelligence, emotion, and wit in unexpected ways, a poetry of what he calls in sonnet LIII “baffling combustions.” Berrigan’s poetry can be at once dazzlingly opaque and utterly clear, full of dense verbal collage and unashamed sentiment, blatantly appropriative yet singularly original. Berrigan established himself as a poet with the radical formalism of The Sonnets (1964), turning the form, as he said in a 1978 interview, into “fourteen units of one line each.” The poems of this sequence collage fragments of Berrigan’s own unsatisfactory early work with words lifted from elsewhere, creating rich and strange textures in fourteen (or fifteen or sixteen) lines.¹ In his final years Berrigan discovered a new possibility for a radical formalism in the writing project 500 American Postcards, which took the postcard as a poetic form, a fixed space determining (along with the variable of handwriting) the size of the poem. It is 5:15 a.m. Happy birthday, Ted. ¹ Rich and strange: including lines from The Tempest. Leash-curb ? 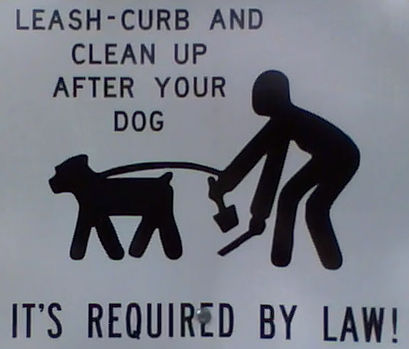 Or leash curb ? Non-native speakers are rightly confused. Leash, curb, and clean up: items in a series. Did you know that gee is “probably a shortening of Jesus! (or Jerusalem! )”? Did you know that jeez or jeeze is a corruption of Jesus? Did you know that jeepers is also a corruption of Jesus? And did you know that sheesh is “probably an alteration of jeez ”? I found my way to these words after using the word jeepers in an e-mail and wondering where it came from. The Oxford English Dictionary identifies all four words as originating in American English. Gee is the oldest (1895). The OED labels jeez (1923) and jeepers (1929) as slang, sheesh (1959) as colloquial. 1959? Sheesh was in use well before that. I can hear Ed Norton speaking to Ralph Kramden, somewhere in the 1955–1956 season of The Honeymooners: “Sheesh, what a grouch!” Get on it, OED. I just heard it again on the CBS Evening News , Scott Pelley’s language of man: “Mankind lands a spacecraft on a comet.” If mankind is supposed to be an improvement on Pelley’s plain old man , well, it’s not. My profession is being demeaned by a pervasive atmosphere of distrust, dictating that teachers cannot be permitted to develop and administer their own quizzes and tests (now titled as generic “assessments”) or grade their own students’ examinations. The development of plans, choice of lessons and the materials to be employed are increasingly expected to be common to all teachers in a given subject. This approach not only strangles creativity, it smothers the development of critical thinking in our students and assumes a one-size-fits-all mentality more appropriate to the assembly line than to the classroom. That’s John Hennessy, the president of Stanford University, appearing in the documentary Ivory Tower (dir. Andrew Rossi, 2014). In this film and elsewhere, Hennessy is a voice of inevitability: disruption and all that. But there’s nothing inevitable about diminished access to real college, by which I mean not dorm life but a community of teaching and learning, with professors and students present to one another. Diminished access is the result of institutional choices: fewer professors, more online courses, more administrative bureaucracy, extravagant construction projects, and ever-increasing costs to students. MOOC developers Sebastian Thrun and John Owens follow Hennessy’s turn in Ivory Tower. Thrun likens online coursework to videogames and says that such coursework “empowers” students. Owens says that online work puts the focus “back on the student,” then blithely speaks of the MOOC professor as a “rock star,” one professor doing the work once done by 500. So who, exactly, is in the spotlight? An often-repeated claim among those who insist on educational disruption is that the efficiencies of teaching — one teacher, one room — have stayed the same for too long. But then the efficiencies of, say, cutting hair — one barber, one head — haven’t changed much either. Perhaps there are good reasons why. The great irony for me in the rhetoric of disruption: those who speak it will no doubt seek for their own children what Hennessy calls “the gold standard.” There will always be real college for the few. For everyone else, it may be another story. But perhaps change is indeed inevitable. Before Ivory Tower was released, Thrun pronounced his company’s courses “a lousy product.” His new venture: nanodegrees. And just two weeks after the film’s release, Hennessy voiced his disappointment with MOOCs. Haircut, anyone? A book editor speaks: “Having a door and a window is starting to feel like having a car and driver.” Read more: Cubicles Rise in a Brave New World of Publishing (The New York Times). There have long been cubicles (or less) in publishing. Back in college, I did a summer internship at Basic Books, whose space was a mix of offices, cubicles, and desks on the open range. I, a lowly copywriter, had an office with a window. The previous occupant, an editor, had recently died. The fellow who supervised me was in a cubicle. The editorial assistants had desks set against a long wall, no dividers. Our students should not imagine they can adopt the working practices of such brilliant exceptions. They are mostly like you and me: Our first drafts aren’t good enough, and need many restructurings, improvements, and corrections before they are fit for a reader. Yes, a few authors can produce publishable prose without ever looking back, but they are outliers, not role models. Balzac “revised obsessively.” Dickens did likewise. So, to the typical student working late Thursday night for a Friday paper deadline I say: You are not Chomsky or Ullman or Trollope, and you have left it too late! You cannot write A+ material the first time through. Next time start your paper at least a week ahead. Then rewrite it. Then read it aloud, and go through it again fixing some more of its faults: the echoes and clunkinesses; the slips in verb agreement; that vague bit you thought you might get away with; the sentence where you decided on a structure but changed syntactic horses midstream and ended up with gibberish. And don’t tell me you don’t have the time! Ordinary working people do 40 hours a week. Typical millionaires work 70 or 80. Admit it, you’re not committing that kind of time to your studies. You can improve that paper, and ensure that reading it isn’t like being repetitively bludgeoned. Please. If you listen to NPR’s Weekend Edition Sunday, you may have wondered what it looks like. 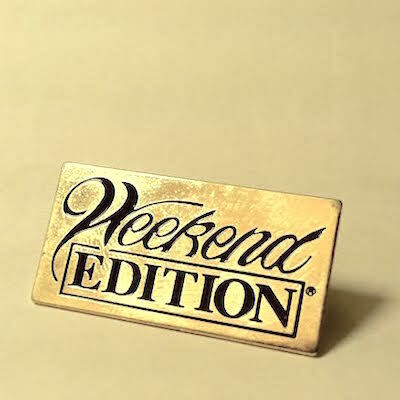 That’s what it looks like, the Weekend Edition lapel pin, one of the prizes for the lucky listeners chosen to play the Sunday puzzle on the air with Will Shortz. I played sometime in the 1990s, back in the days of sending in postcards. My challenge was to figure out word pairs with an added x. I remember maim and maxim. In 2011, I vowed to find this pin, long out of sight and mind. I also won a Merriam-Webster’s Collegiate Dictionary (10th ed. ), much less shiny, and always in sight. “In the 1950s, advertisers and manufacturers discovered in teenagers a lucrative market for consumer goods”: Ellen Lupton presents Henry Dreyfuss’s Princess telephone. It’s Cooper Hewitt’s Object of the Day. At Cooper Hewitt’s Object of the Day, Ellen Lupton writes about Henry Dreyfuss’s Model 302 and Model 500 telephones. Bonus: Henry Dreyfuss’s account of his undercover work as an telephone repairman’s helper. November 10: Cooper Hewitt has revised the post to make clear that an actor is reading Dreyfuss’s words. Never heard of it before today: Fountain Pen Day. My favorite OCA pen post: Five pens. Thus, in order to understand why Apple has been so successful in previous partnerships — and, looking forward, to better estimate the chances of Apple Pay becoming widespread — it is essential to understand how the company acquires and uses leverage. Needless words. Successful partnerships must already exist, so there’s no need for previous. “Looking forward” is unnecessary, as there is no place else to look if one is gauging prospects for success. I see little difference between estimating and better estimating: one would want one’s estimates to be good ones. Lifelessness. “It is essential to understand” is boilerplate term-paper language, lacking in agency. Here again, Richard Lanham is helpful: “Find the action,” he suggests. Who does (or did, or will do) what? The fix here: a transitive verb in the active voice. To understand Apple’s success in partnerships and to estimate the chances for Apple Pay’s success, we must understand how Apple gains and uses leverage. Twenty-four words, fifteen of them preceding the subject. I’ve condensed and rewritten in several other ways, which I’ll leave to speak for themselves. Revising this sentence took perhaps a minute. Explaining in this post, revising my sentences while doing so, much longer. Sally Rogers (Rose Marie) is struggling to come up with a comedy bit. The Dixon Ticonderogas aren’t helping. The pencil stage right? Perhaps a Mirado or Velvet. I think my state just moved to Wisconsin. Five minutes of election-night coverage on CNN and I reached my limit: John King’s never-stop-to-take-a-breath delivery is unnerving. No more coffee for him. Go to System Preferences and click on General. Click on Highlight color and choose Other. Whatever custom color you choose, the result will be a pale green. When I called Apple, I spoke with two tech-support people. The first went through these steps on her Mac, confirmed the problem, and transferred my call to a higher-level person, who filed the bug. Will it be fixed in OS X 10.10.1? I hope so. I like Yosemite more and more. Or perhaps I should say that I like a slightly modified Yosemite more and more. Changing the system font back to Lucida Grande and darkening the Dock background with cDock makes the new design more attractive. November 18: I just updated to 10.10.1. The bug’s still there. May 4, 2015: Fixed in 10.10.3. Custom color works in some places and not others. Still broken. It is difficult to shake the suspicion that Pinker’s list of “screwball” rules simply seeks to justify bad habits that certain people would rather not be bothered to unlearn. “Fewer” versus “less”? Do whatever sounds good, Pinker says, but maybe favor “fewer,” if you can, but not because “less” is wrong. Good luck! I opened The Sense of Style in a bookstore this weekend and landed at the discussion of between you and I. Two pages to argue that it’s not really a mistake, followed by the observation that writers are “well advised” to avoid it. Good luck! Is it wrong to take pleasure in a musuem’s empty display cases? Of course not: if it were, I wouldn’t be posting this photograph. I was amused yesterday to see several other museum visitors admiring empty cases. That each of these visitors was perhaps a quarter of my age didn’t trouble me: art, or its absence, is an experience available to all. This empty display reminded me of a blackboard of course. (See Friday’s post.) 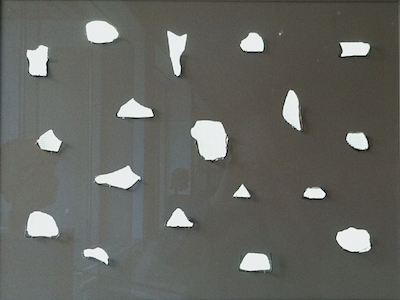 The white shapes, which look from a distance like rock shards, are the spaces where the vessel fragments have been removed. Light shines through from behind. The great reason to visit the Art Institute right now is the exhibition Heaven and Earth: Art of Byzantium from Greek Collections. The exhibition begins with a Head of Aphrodite, its eyes gouged out, its forehead marred by a crude cross. Goodbye, old gods. 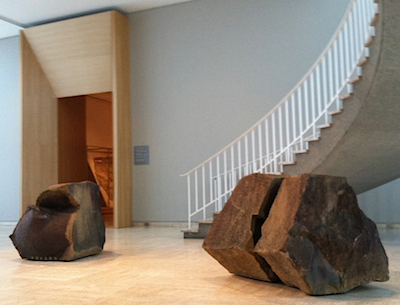 I was moved by the anonymity of imagination and labor in the works on display: icons, manuscripts, mosaics, textiles. 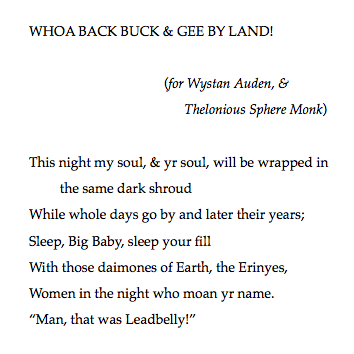 (Only two works, fifteenth-century icons, bear signatures.) My most exciting finds: a thirteenth-century Picasso-like Bowl with Dancer and a fifteenth-century interlinear Iliad.